Pittsburgh, Pa., Aug 6, 2018 / 11:30 am (CNA).- The Bishop of Pittsburgh has pledged to release the names of all priests of the diocese accused of abuse against a minor. He made the announcement Sunday, August 5, in a letter read at every Mass in the diocese. Bishop David Zubik also encouraged abuse survivors who had not yet come forward to do so. The announcement comes shortly before the publication of a 900-page grand jury report on sexual abuse allegation in six Pennsylvania dioceses – Allentown, Erie, Greensburg, Harrisburg, Pittsburgh, and Scranton. The report is believed to detail allegations of widespread sexual abuse and cover-ups within the dioceses over the last 70 years. It is expected to be released later this week and to contain the names of approximately 300 individuals suspected of abuse or of covering up abuse. The report was initially scheduled for publication at the end of June, but delayed following legal challenges by some of those named in it. After initially staying the release, the Pennsylvania Supreme Court ordered that a partially redacted version be published no later than August 14. Sources have told CNA that the Pennsylvania dioceses are expecting it to be released on Wednesday, August 8. 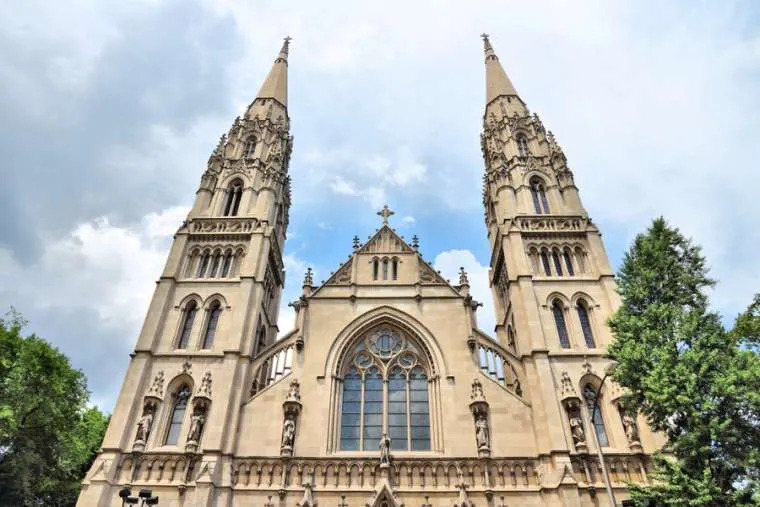 Bishop Zubik said that the Diocese of Pittsburgh had “fully cooperated” with the state’s attorney general and has not tried to block publication of the report. The full list of accused clergy from Pittsburgh will be released after the grand jury report, Zubik explained, “out of respect for the work of the grand jury and the process outlined by the Supreme Court of Pennsylvania.” Other dioceses in the state, including Harrisburg, have already released lists of priests, deacons, and seminarians who were accused of abuse or misconduct during the past seven decades. In the letter, Zubik told parishioners that more than 90 percent of abuse claims occurred before 1990. The period investigated by the state’s attorney general includes the period when Cardinal Donald Wuerl served as Bishop of Pittsburgh. Wuerl was bishop of Pittsburgh from 1988 until 2006, when he was appointed the Archbishop of Washington. Over the past 30 years, Zubik said, the Diocese of Pittsburgh has implemented new policies “to respond quickly and compassionately” when abuse victims come forward. “We respond to allegations today very differently than decades ago,” said Zubik. Now, when a credible allegation is made, the priest or deacon is immediately suspended from ministry, law enforcement is informed, and his name is released. Additionally, all employees and volunteers within the diocese undergo a background check and receive training on how to prevent and identify sexual abuse. There are no priests or deacons serving now in public ministry in the Diocese of Pittsburgh who have been accused of sexually abusing a child, Zubik said. By releasing the names of the alleged abusers, Zubik hopes that this will strengthen the trust of the faithful. In the past, the bishop said that he “truly believed” that giving names to law enforcement was “appropriate and sufficient action,” but now believes in the need for increased transparency on behalf of the diocese. “Every act of child sexual abuse is horrific, no matter how long ago it occurred,” said Zubik. San Jose, Calif., Aug 28, 2018 / 07:01 pm (CNA/EWTN News).- A 73-year-old bishop in California has changed his retirement plans after media reports sparked criticism of his decision to purchase a five-bedroom home for $2.3 million in California’s overheated housing market. While Bishop Patrick McGrath of San Jose said the purchase made economic sense as a good investment, he said he “erred in judgment” to purchase the house. The diocese will put the house up for sale “as soon as possible” and any profits will go to Charities Housing, under Catholic Charities of Santa Clara County. “I assume full responsibility for this decision and I believe that the sale of the house is the appropriate action. I thank those who have advised me,” he said. The 3,300 square-foot home sits on one-third of an acre in San Jose’s Willow Glen neighborhood. The bishop first considered living in a diocese-owned house on cemetery property, but the retrofitting would have been too expensive. Liz Sullivan, communications director for the Diocese of San Jose, told CNA the renovation’s exact costs are not certain but the return on investment would not be good, “since few people would choose to live in a cemetery.” The house’s future would have been uncertain after the bishop left. “The bishop is in good health for a man of 73, but a single-level house was desirable because of the stairs,” Sullivan added. McGrath said the Diocesan Finance Council and the College of Consultors approved the home purchase which later became a matter of controversy. “I agreed with them that in economic terms the purchase of the home made sense in terms of financial return on investment,” said the bishop. The median sale price of a home in the city is now over $1 million, compared to a California-wide home price of $600,000, a record high as of May 2018, Business Insider reports. In the last year, the median sale price of San Jose homes increased by 24 percent ($210,000), the real estate site Trulia reports. The bishop, who became head of the Diocese of San Jose in 1999, said when his retirement planning began he wanted to stay in the diocese. “This has been my home for nearly 20 years,” he said. Under policy set by the U.S. bishops’ conference, the Diocese of San Jose is responsible for paying the bishop’s housing and upkeep when he retires. McGrath said the home was purchased using a fund dedicated to housing retired bishops and using proceeds from the sale of a Menlo Park condominium where his predecessor, Bishop Pierre DuMaine, had lived before he moved into assisted living. “Our diocese is greatly underfunded as it is,” said the parishioner, who asked the Mercury News not to be identified to avoid harming relationships with other Catholics. The Mercury News’ report cited Bishop McGrath’s own advocacy for affordable housing, such as a 2016 commentary piece backing a $950 million bond measure for affordable housing. In his initial remarks, McGrath said he had looked at places “way out in the East Bay,” but he liked the valley. “I thought it would be nice to be here, to be of assistance if I can,” he said. 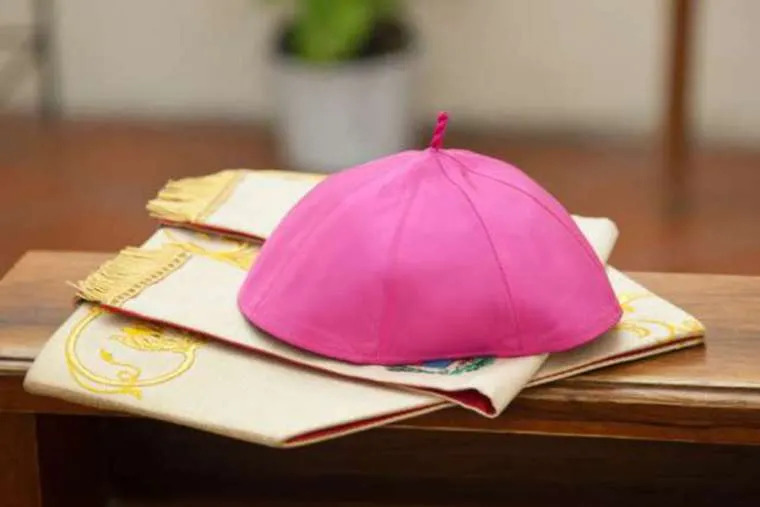 The bishop has not announced a retirement date, though he has asked the Holy See permission to retire before the required retirement date of 75 years to allow a younger man to become bishop. Bishop Oscar Cantú, 51, was named Coadjutor Bishop of San Jose in July; as such, he will succeed as Bishop of San Jose upon Bishop McGrath’s retirement. The retiring bishop had looked forward to a house with a yard. McGrath acknowledged to the Mercury News that many retired clerics live in retirement communities, in rectories, or in other accommodations. “But I’d like to live in a house so I would have the freedom to help the diocese but not disturb the priests in the rectories,” he said. Washington D.C., Dec 3, 2018 / 01:30 pm (CNA).- George H.W. Bush, who died late Friday, served as a fighter pilot in World War II, head of the CIA, vice president under Ronald Reagan, and as the 41st president of the United States. But he maintained throughout his last years that his most important role was that of a father of six. “I can honestly say that the three most rewarding titles bestowed upon me are the three that I’ve got left: a husband, a father and a granddad,” Bush said in 1997 at the opening of his presidential library in Houston. In the days following the president’s death, Catholics around the country remembered the 41st president for his character and family values. As a congressman, Bush represented Texas’ seventh congressional district, which is within DiNardo’s archdiocese. “President Bush’s career in the public eye – from the Lone Star State to the global stage – was marked by incredible statesmanship and honor,” DiNardo said in a statement released by the archdiocese. Bush’s marriage to Barbara, who died earlier this year, was the longest marriage in the history of the American presidency. 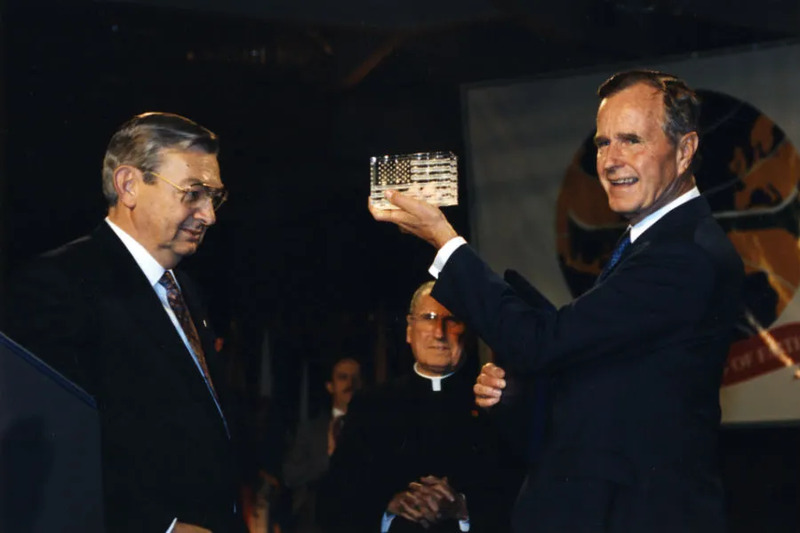 In his speech at the 1992 Knights of Columbus convention, President Bush, an Episcopalian, spoke of the importance of character and morality in American society. “I think my parents were like yours: They brought me up to understand that our fundamental moral standards were established by Almighty God. They taught me that if you have something for yourself, you should give half to a friend. They taught me to take the blame when things go wrong and share the credit when things go right. These ideas were supported by society,” he told the Knights. “He knew that religious liberty produced varied and wonderful fruits, especially in the areas of charity and service. He knew us at the Knights. He encouraged us and did so personally at two of our conventions, including in 1992 as president. We are grateful to have known him and now pray for him and his family” Cullen said. “The President should set the moral tone for this nation,” Bush said. Other bishops and Catholic voices have issued their own tributes to the 41st president. “A gracious and humble man who lived a life of service to others, President George H.W. Bush is remembered as a man of character, a husband and father who did his best to bring about a kinder and gentler nation. He guided our country during difficult times with grace, dignity and courage,” Bishop Nelson Perez of Cleveland said Dec. 1. Bishop Robert Deeley of Portland, Maine, also extended his prayerful sympathy to the Bush family. “He will be remembered for his integrity. A man of faith and humility, may he be at peace with the Lord he served in life,” Deeley said. Bush met with Pope Saint John Paul II in Rome twice during his presidency. Though the two leaders disagreed over the U.S. military intervention in the Gulf War, Bush described his last presidential meeting with John Paul II as “major tour d’horizon, touching on all the trouble spots” in the world. When Bush first entered politics as a Republican Congressman, he supported funding for Planned Parenthood, however he went on to be an effective pro-life president. Bush used his power of veto to stop 10 bills with pro-abortion provisions, according to the National Right to Life Committee. Bush’s funeral will be held at Washington’s National Cathedral on Wednesday, Dec. 5 with President Donald Trump and his wife in attendance.